Sheriffs speak with a man who ran over the foot of a security officer at the entrance of Parking Lot 1 at Pierce College in Woodland Hills, Calif. on Feb. 9, 2015. Photo: Calvin Alagot. 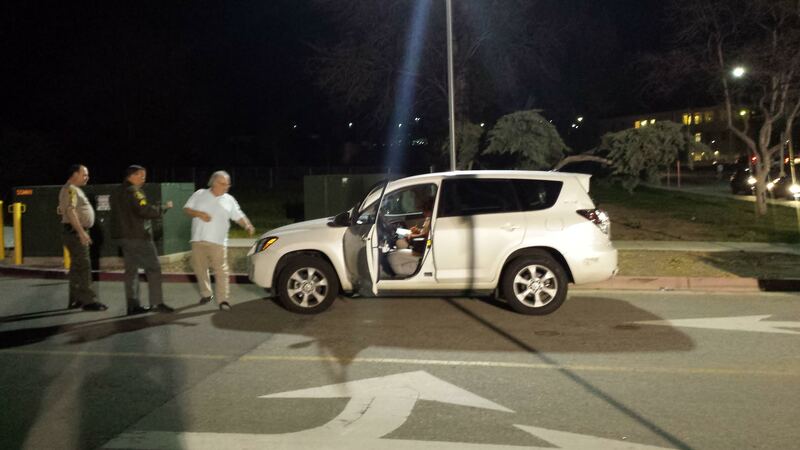 A Pierce College security officer’s foot was run over by a white Toyota RAV4 while he was directing traffic at the entrance to Parking Lot 1 around 7 p.m.
Additional reporting by Titus Littlejohn and Malik Walker.